Just How Much Trouble Is Avid In? 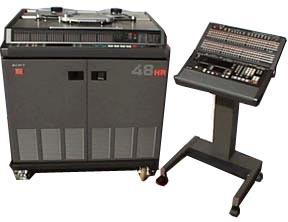 I remember when the commercial studio world revolved around the Sony 3348 48 track digital tape recorder. If you owned a studio that catered to major label clients, this machine was an absolute necessity, and at a cost of around $250k each, they were a major investment that a studio owner had to make to stay in business - for about 6 months. It seemed that as soon as every major studio finished their investment cycle with these machines that their use and value fell like a rock, thanks to the rapid transition in the music world to Digidesign's Pro Tools digital audio workstation as the storage medium of choice. Today you can find a 3348 for a couple of grand, but most owners would probably even pay you to take the big bulky hulk of metal off their hands. This one-time superb piece of audio technology became a boat anchor in almost no time, and unlike analog gear from that era, has virtually no chance of having new life breathed into it via the vintage market. It sounded great for it's time, but it's quality and function is not even in the ballpark of what we can buy today for a mere fraction of its original cost. Pro Tools has gone on to completely change several areas of the audio business, from music to broadcast to post, and has become the de facto standard in most professional settings. That said, it's now owned by Avid, a company previously known for it's video editing software (the video equivalent of Pro Tools) than anything else. The problem is, Avid is in trouble. Avid's trouble started when Apple introduced Final Cut, which was cheaper than anything that Avid had to offer and eventually just as capable. Soon the market was saturated between the two systems, with virtually no growth left, so Avid purchased Digidesign to get a piece of the still growing professional audio market. Eventually that topped out too, so the next move was to go into consumer audio and Avid acquired M-Audio among other similar companies. To many of Avid's stockholders, the company was on a roll as stock prices reached a high of over $28. But the audio business, consumer and professional combined, is actually quite small compared to other businesses, and once again Avid was undermined by Apple and their Garageband software and less expensive versions of Logic. Suddenly the stock was in trouble and began to drop like a rock. Earlier this year, the company decided that it had enough of the consumer business and sold it off in order to stop the stock price hemorrhage. The existing professional audio and video market is pretty finite though, and competition is tough, which means that Avid's revenue has fallen from a high of $12+ this year to just half of that today as investors continue the rush to sell. They understand the stock price isn't coming back. Which brings us back to the Sony 3348. You can own the market and almost overnight lose it if something newer, cheaper, and better (or two of the three) comes along. You can also lose it if the company is struggling financially and there's no money left for innovation. I think you can see where this is going - Avid is in trouble. In recent months long time Avid employees have been jumping ship for other companies in the industry, seeing the writing on the wall. That's never a good sign. 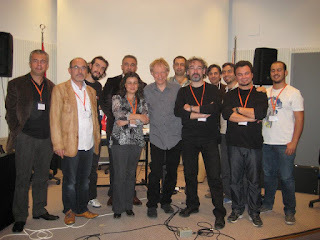 And the company didn't even show at the last AES convention in San Francisco a couple of weeks ago. Not a good sign either. I don't think that Pro Tools would ever go away overnight the way the Sony 3348 did because the installed user base is so high (especially in post and broadcast), but I wouldn't be surprised if we see some changes in the company in the very near future. One thing I do know, there are a number of other companies out there circling like vultures preparing to pick up the pieces of Digidesign, whatever they may be. Watch this story carefully over the next few months. Will The 4 Armed Robot Drummer Replace A Human? Drummers absolutely hated drum machines where they first came on the scene, threatened by their perfect time. After a while, most learned to embrace the machine and live with it, with most drum machines getting jobs that a real drummer would never have gotten anyway. But what happens when you have a robot that plays with perfect time? Here's a video of a 4 armed robot drummer doing his best Tommy Ramone imitation of "Blitzkrieg Bop," which I don't think will have drummers quaking in their boots -- yet. Notice that it (he?) never plays any fills, and the feel is very eh, robotic. OK, you live in an apartment or have some neighbors with sensitive ears so you can't crank up that Marshall to get your sound. What you really need is an isolation box to keep the level from waking up the baby next door. Here's a pretty good video on how to make a guitar amp isolation box, with some caveats. The layering technique that's described definitely works, but I'd replace the acoustic foam with some Rockwool or Owens Corning 703. This is the same stuff that's used in recording studios and if you use Rockwool, it's a lot cheaper and much more effective than acoustic foam. You can find out a lot more about what it is and where to find it from this post on acoustic treatment, or from The Studio Builder's Handbook. 1. Make sure that the seal on the box is absolutely tight for max isolation. Air is like water and if any can leak out, there goes your isolation. 2. If you place a combo amp inside, it's going to heat up because there's no place for the hot air to escape, which can end up causing some major damage. You're better off using just a speaker cabinet inside. 2A. Players tend to crank their amp up all the way when you get as much isolation as an iso box can offer, but be careful. It's really easy to overheat your amp head even if it's not in the box. Once again, this can cause considerable damage. 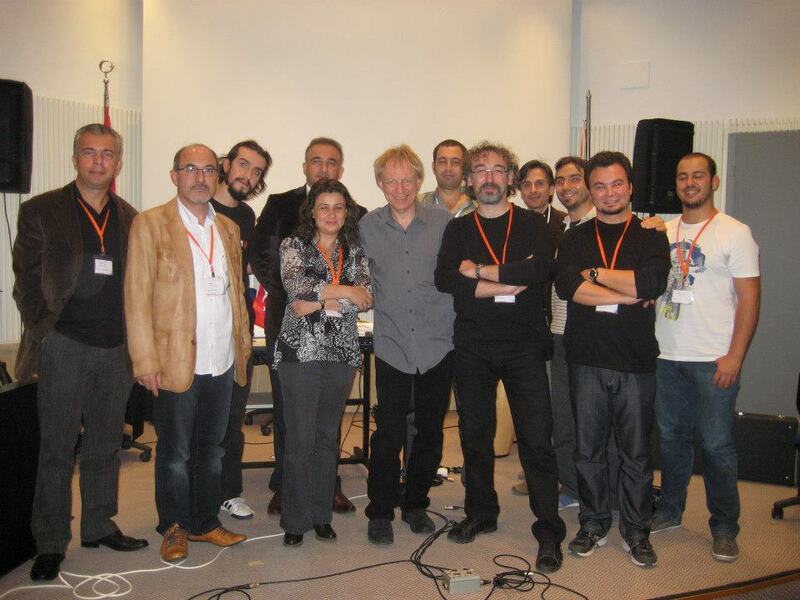 Last week I was extremely pleased to be part of the Audio Technologies for Music and Media (ATMM) conference at Bilkent University in Ankara, Turkey. Having never been to Turkey before, I can only say that it was a wonderful experience in almost every way. Turkey is a beautiful country with an extremely rich heritage, and its people are friendly and hospitable beyond compare. I opened the conference with a keynote presentation called "The Music Business Is Not Dying" which looks at the current state of the music business and the 3 keys of how the student of today can prepare for a place in it. 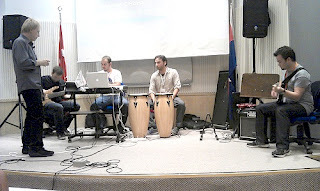 The conference (the very first of its kind at the university) then went on to provide a number of fascinating presentations, panels and papers on everything from real time improvisation via a computer environment to soundscapes triggered by EEG waves to the three technologies that have radically altered music, and many more that can be mentioned here. I enjoyed each and every one and congratulate their presenters. 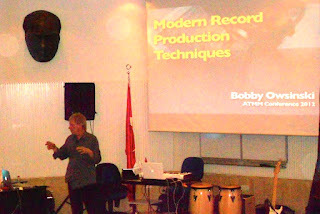 I then closed the session with a "Modern Record Production Techniques" presentation that looks at some of the frequently overlooked parts of record production, then included a workshop where I demonstrated some music production techniques with a live band. Although I'm severely jet-lagged thanks to the 30 hour trip home (complete with 5 security checks and two bag searches), I'm coherent enough to know that this was clearly one of the best experiences I've ever had. Every college and university treats me well when I speak, but Bilkent went above and beyond any expectations I had beforehand. In no specific order, thanks to Ufuk Onen for arranging that I speak at the conference and being my champion there. Thanks to Ahmet Gurata, Teoman Pasinlioglu and Bulent Biyikoglu for your help and support, especially with the power adapter that I so desperately needed to do my thing. And finally, many, many thanks to Mustafa Ertan for being the world's best tour guy, with driving skills worthy of a Grand Pres driver. Your hospitality will be forever appreciated. I have a number of presentations of "Social Media For Musicians and Engineers" coming up at a number of schools. If you'd like me to speak at your school, college or university on any of the above subjects, or provide a master class or workshop, feel free to contact me. I covered this in my AES report last week, but I think the Focusrite Forte interface deserves another look because it's perfect for many small yet high-quality studios. It's a pretty cool 2 in 4 out audio interface/monitor with some great audio specs and features, including a couple of Red series mic pres, sample rates up to 192kHz, and some plugins that model the famous Focusrite ISA110 EQ and ISA130 compressor. It retails for a modest $599 and is available now. Here's a video that explains how it works as well as it's features.